I have a stubborn bump on my eye that won’t go away. It’s been there for almost two months but I just couldn’t seem to pick up the phone to make another appointment to sit in another waiting room to see another doctor. Finally last week I went to see my primary care doctor about it. She looked at my eye and asked how long the bump had been there. I told her two months and she said I should have come seen her sooner, because now what she thought was a stye had hardened and I might need to have surgery to remove it. I knew that I should have visited her earlier, but the stye showed up as I was having my ovaries removed and I just couldn’t deal with one more thing. After looking at my eye, my doctor told me that I should go see an ophthalmologist, since the stye had been there for two month. She gave me a referral, a prescription for erythromycin and I left the office. I got into my car and immediately started crying. I know it’s just a stye. It’s really no big deal, right? But when I heard the word ‘surgery’, I immediately flashed back to my mastectomy. It was like PTSD. Something as simple as having a stye removed sent shivers down my spine and made me flashback to being in the hospital going under the knife. 2014 was supposed to be a surgery-free year. WTF! So today I went to see the ophthalmologist. She was actually a wonderful woman who was very smart and caring. I sat down and she told me that what I have is not a stye, but actually a chalazion, which is a small lump on the eye. She said they’re most often caused by stress. She asked if I was experiencing any stress. I just laughed. You mean the stress of having breast cancer? Or the stress of having a mastectomy? Or the stress of going through chemo? Or the stress of radiation? Or the stress of having my ovaries removed? That kind of stress? Then she told me she was an 11-year breast cancer survivor. So she understood. She went through the same thing. Then she said, “there is life after breast cancer.” I smiled. I knew I’d have a good cry about that one later, in the privacy of my own home. She gave me a prescription for steroid drops that she thinks will help make the lump go away. She said we could do surgery to remove the chalazion, but we should try the drops first, unless I wanted to do the surgery. I said, no thank you, I’ve had enough surgeries. Fingers crossed that the drops work and I’m done with what is hopefully just a minor annoyance. 2013 was a busy year for me. Finishing treatment for breast cancer, monitoring every other month for ovarian cancer, surgery for possible ovarian cancer and dealing with the emotions of all of this. For 2014, I’m hoping for less. Less surgeries – actually hoping for a surgery-free year, or several years. Less scans (and less scanxiety). Less pill taking – 1 year of Tamoxifen done, 9 more years to go. But who’s counting? Less naps to make up for the fatigue associated with cancer treatment. Less tears – although some, not many, felt good to get out. Here’s to less in 2014. When Is My Brain Coming Back? My brain still isn’t working like it used to. I’m not sure if its chemo brain lingering, or my mind trying to get back to fully functional, or something telling me to take it easy. Words come to me slowly. In fact, sometimes they don’t come to me at all. And I’m not talking about complicated words. The other day at work, I couldn’t think of the word chair. CHAIR! I had to act it out to my co-worker, like we were playing charades. Could have been funny at a party, but during a work meeting…not so funny. Luckily my co-workers are also friends, so they were quite gracious with me. It was another daily reminder of what I’ve been through from breast cancer and how my brain hasn’t gotten back to normal yet. Before I started chemo, I talked to many women who had been through what I was about to go through. One of the things they told me was that their mind still hadn’t gotten back to fully functioning. Some of these women were 3-5 years out of treatment. They said they couldn’t multi-task like they used to. And that their concentration wasn’t as good either. I thought they were being dramatic. And I thought, oh, that won’t happen to me. Well…here we are. I’m trying to be patient. Next month marks my one year anniversary of finishing all my treatments. 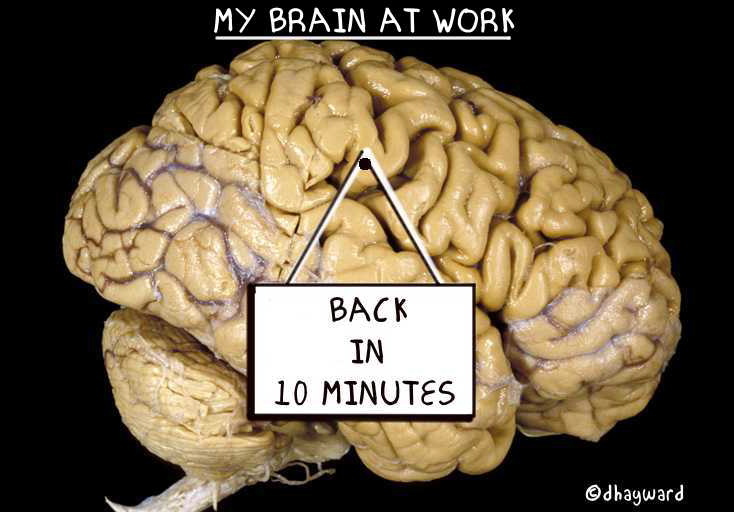 Everyone reminds me that it takes a while for the body and brain to get back to 100% functionality. I’m hoping that magically a switch is flicked in my brain that makes it work again at the one year mark. Patience with myself is not one of my strengths. Another stupid lesson to learn from this ordeal. There’s a saying in the cancer community – “the new normal” – how to navigate your life after diagnosis and completing treatment. But I’ve come to see that my new normal is actually more like the new brain. I’m sure there’s a more sophisticated word to describe how I feel about this new brain, but the only thing that comes to mind is UGH!